Our Macmillan Information and Support Centres offer people affected by cancer access to high-quality, comprehensive and appropriate information and support – for all stages of the cancer journey. We are here to provide information and support to anyone affected by cancer. You may have cancer yourself, care for a friend or relative, work as a health professional, or simply want to know more about cancer. The service is staffed by a Macmillan Information and Support Manager and supported by trained volunteers. We can listen to how cancer is affecting your life and direct you to other sources of information and support. We also offer guided internet access. 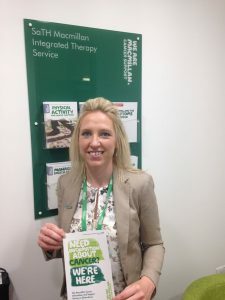 Macmillan Cancer Support and Shrewsbury and Telford Hospital NHS Trust have worked together to develop the information centres at the Hamar Help and Support Centre in Shrewsbury, and the Princess Royal Hospital in Telford. You don’t have to be a hospital patient to use our service, and you don’t need an appointment, but if you are making a special journey please ring to ensure we are open. The centres are open from 10am to 4pm, Monday to Friday. If you can’t visit the hospital, contact can be made via telephone or email. For more information, please see our Macmillan Services leaflet or our Cancer Services page.